Ultimate Bass Kit is perhaps the only set of bass samples you will ever need. Ultimate Bass Kit is a collection of 13 bass sample soundsets employing different playing styles - see below for the full soundset listing. The focus of the collection is on clean, crisp - and most importantly, playable - samples, with many articulations arranged to give the player fast access to create a precise and highly nuanced performance. All of the samples were DI'd (direct injected) for sampling. The advantage of this approach is flexibility - you can process the sounds however you want. For instance, you can use the clean samples, you can apply some FX (perhaps some compression and a bit of chorus) or you can re-amp the samples by running them through an amplifier. Whatever course you choose, you have precise control over your sounds and the highest quality sound source. 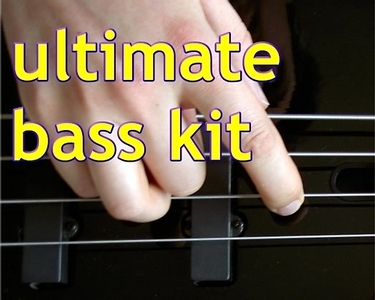 Ultimate Bass Kit is available for immediate download for $29.99. The soundsets are available in either SoundFont or ManyStation wusikSND format, or both. See details about the formats below. Ultimate Bass Kit is available in two formats SoundFont and ManyStation wusikSND format. With the SoundFonts you get the samples in SoundFont format. With the ManyStation wusikSND format samples, you get the soundsets and a bank of patches created by professional sound designers. The wusikSND format soundsets can be loaded into ManyStation, any WusikEngine compatible VSTi (such as WusikStation) and any player which recognizes wusikSND format files (such as EVE One from Dash Signature). Funkimosis This last track was created with Ultimate Bass Kit and ManyStation. The Bassics soundset has a range of samples of the bass being played in a traditional way with the strings being plucked with a finger from above the pickup. The Fingered soundset is similar to the Bassics sound, however, it was designed with "finer" bass playing in mind and gives you very clean sounding bass lines and solos. The strings were plucked as close to the bridge as possible. The Muted soundset gives the kind of tone that was often used in 1960s rock. For these samples, the strings were muted at the bridge with the palm of the right (picking) hand. This gives a deep, mellow tone. In the early days of recording the electric bass guitar, engineers used to make bassists use picks (much to bassists' disgust, in many cases) to give the recording a brighter, cleaner sound. With current playing techniques, the use of picks is fairly prevalent in metal and other styles where fast picking is appropriate. Many other bassists who use their fingers will occasionally use picks to get a particular sound. This bass articulation is a combination of picking and muting the bass. The bass was muted at the bridge with the palm and then picked close to the bridge, giving a deep, muted tone, but with a percussive pick sound. Natural harmonics are the simplest kind of harmonics on a bass. They are made when a string is plucked while a finger rests on a certain spot it (typically at the octave or another harmonically related point on the string). This effect creates a much higher pitched bell like tone. For the samples, the string was picked as close to the bridge as possible to give the harmonics a clear tone. The artificial harmonic is a special technique used to play a harmonic at any pitch. There are several ways of playing an artificial harmonic, but for these samples, the thumb and index finger method was used as it gives the purest sound. For this, the thumb was placed on the string at a harmonic spot and then the index finger plucked the string. Parallel slapping is the style of slapping that most bassists employ. The thumb is positioned parallel to the strings. When the strings is hit the thumb goes past the strings, allowing the possibility of pulling the thumb back up, hitting the string again. Bassists such as Victor Wooten use this "double-thumbing" technique because it allows you to play much faster than the traditional bounce-thumb-off-strings slapping style (see Perpendicular Slapping, below). Bassists using this method can also play fast triplets by hitting the string with the thumb down, then popping the string back up with the thumb up, and then plucking the string. The Perpendicular Slap is a less civilized version of the parallel slap sound. This is the technique were the thumb is positioned perpendicular to the strings when the string is slapped - this gives a different tone when compared to parallel slapping as the strings are pushed onto the frets by the slapping thumb to a greater extent than happens with parallel slapping. This playing style also sounds different and more percussive, because with a string is slapped, the thumb hits the other muted strings simultaneously. Using tapping, bassists are able to play bass lines and melodies at the same time, or rich chord patterns. Tapping is where both hands are used to fret the strings, hitting the string hard enough so that it is fretted and sounds at the same time. The Deep Bass soundset gives a very unique sound that is achieved by plucking the strings with the thumb close to the neck. It gives it a really cool, synth-like bass sound. To make this bass sound authentic an old rag was put under the strings at the bridge to mute the strings like a lot of reggae bass players do. The strings were plucked close to the neck to give it a deeper tone. This bass sound is intended to be as funky as possible. In the sampling sessions, the left hand muted the strings like Francis Rocco Prestia (Tower of Power) does. The strings were also slightly over-plucked to get a funky percussive sound. Click here if you want to read the Ultimate Bass Kit manual which gives further details of the product.